This has been a good and very warm month here in Phoenix. My work is increasing as more people hear about me and decide to ask me to work on their projects. One that is 99% complete that I had hoped to share was the Mid-Century Modern dresser that has been modified to become a double vanity. Unfortunately some of the parts required to complete this job were the wrong ones so we’re waiting on those to come in so the plumber can finish the installation. I can give you a teaser picture of how the drawer was modified so the drain has a way to through each drawer. 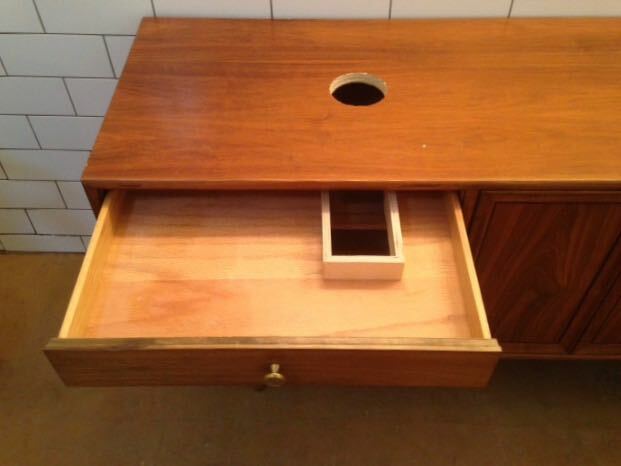 My client has all of the drawers and has promised to send pictures of the completed vanity, I’ll explain and give you details of how this problem was solved then. 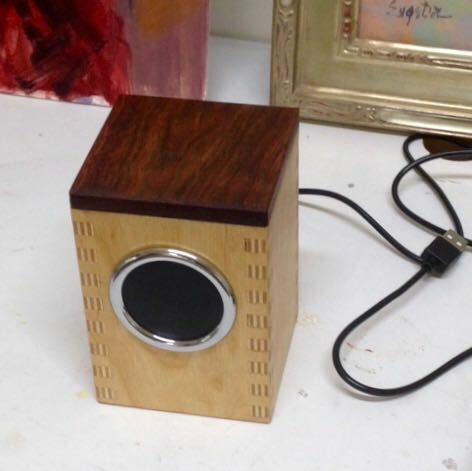 A quick and fun project this month was to make a blue tooth capable speaker for Diane to use in her studio and car. Rockler Woodwork sent an email showing this little speaker so decided to give it a try! The radio went out in her car and the price of this kit was way less than the repair cost for that. Made a little holder for the speaker that fits in the cars cup holder and it works great. Now she can do Pandora on her iPhone and hear it. I’ve always wondered it Baltic Birch Plywood could be finger jointed and now I know — yes it can! Last of all, work has begun on a new frame for one of Diane’s paintings titled Cheers. It’s on stretched canvas and measures 20″ square. In it, the lady is holding a Martini and my first thought was olives! After a bit of image searching I had enough information to design a gently flowing design that’ll go in each corner. Again, my go to source for making a pattern is the plastic containers used for salad that you get at the store. After drawing it out, the pattern is spray glued to the plastic which is then cut out with the appropriate chisels. Here’s a photo montage of the process. Diane’s painting has been accepted in a show but I have until the beginning of January to get it finished. This entry was posted in Artist, Carving, Finger Joint Box and tagged blue tooth, Carved Picture Frames, custom frame molding, custom picture frame, Olive leaf pattern, Pandora, Robert Lemler, Rockler Woodwork Blue Tooth Kit. Bookmark the permalink. 2 Responses to November; Another Month Gone! Congrats on the framing commissions John! They’re getting you where you wanted to be, and BTW look great.